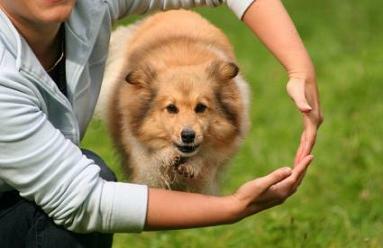 If you have the time, patience and a dog, there is no limit of the tricks you can teach your dog, young or old! Teaching tricks establishes a pattern of learning, teaches skills and focus, is a positive method of training, and promotes a bond between your dog and yourself. Whether you are training your new puppy or teaching your older dog new tricks, training can be a fun and rewarding experience for both you and your dog. Dogs especially Herding dogs (Border Collie, Sheltie, Australian Shepherd etc) are notorious for “entertaining” themselves in all kinds of destructive ways. Entertain and challenge your highly intelligent dog to learn dog tricks, which provide an outlet for your dog’s boredom so that he/she doesn’t renovate your house or yard in ways you don’t approve.